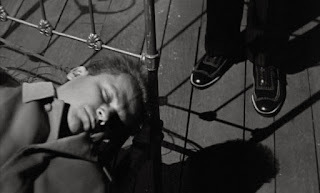 Kiss Me Deadly (1955) is a typically depraved hardboiled film noir story, with an uncaring and sleazy anti-hero. There are complex plot threads that form an overall labyrinth that has to be ignored if you are to enjoy the story, and Cold War and nuclear paranoia grow like rampant weeds through this, eventually and dramatically engulfing everything. Kiss Me Deadly has many of the elements of film noir — a stark opening sequence, several destructive femme fatales, a clutch of low-life gangsters, and many expressionistic lit night-time scenes. There is also within this mess of noir, a vengeful quest, and a constant dark mood of hopelessness, which shows that the patterns of film noir had by this late stage in the canon been refined into a high art in themselves. 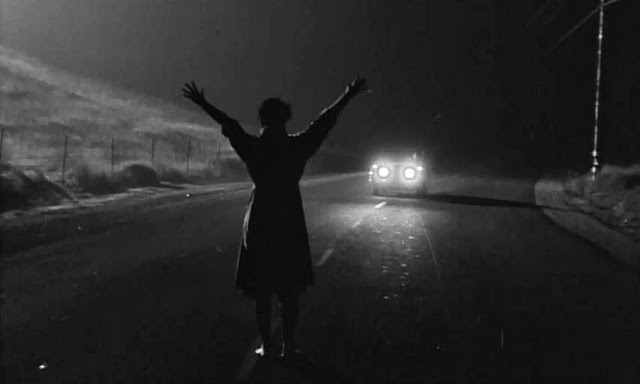 It is also the closing point of the canon, the last ever film noir — so everything after May 18, 1955 — the day that Kiss Me Deadly was released — can officially be known as ‘neo-noir’. That's what they say, anyhow. 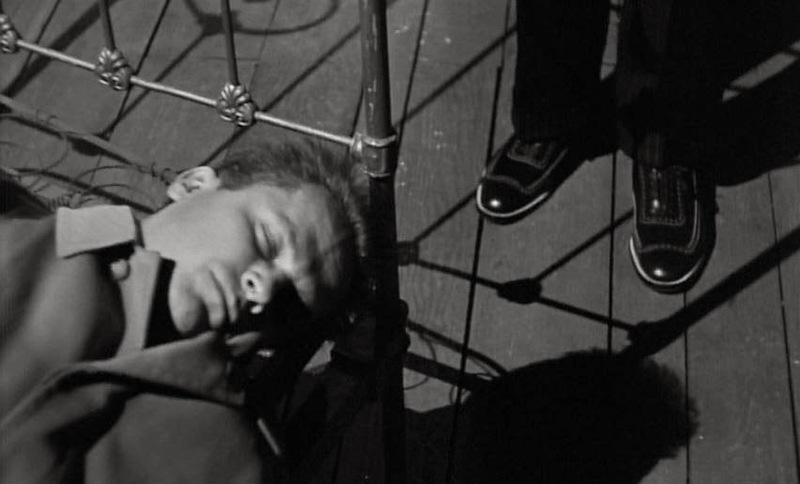 Shot over one month in late 1954, and for an exceptionally low budget, Kiss Me Deadly and has plenty in terms of disorienting camera angles and moody weirdness, not to mention violence and a whole lot of nasty characters, including the lead, played by Ralph Meeker. The unconventional compositions of Ernest Laszlo stir this up nicely, and even if you don't entirely get the story, you'll be surprised at the levels of cruelty, which kick in from the outset. You’ll also be surprised by the credits if you've not seen them before, because they appear from the bottom of the screen and roll towards the top, while Nat King Cole’s Rather Have The Blues plays. The camera is pointed towards the highway’s white line, and as the skewed road trip begins, you have no idea the nonsense you are about to suffer in the name of art and entertainment. And how they ever thought this was a good idea, is anybody's guess. 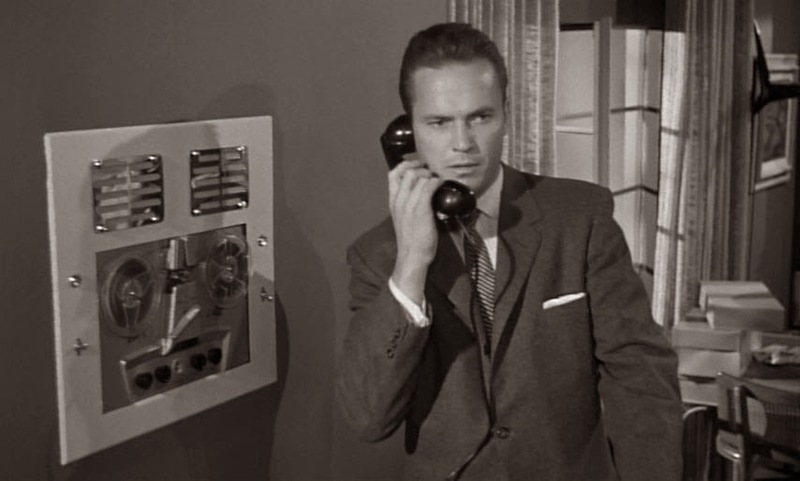 As for the action, if it isn’t Mike Hammer working the first ever answering machine you have ever seen — the contraption is insane, but was new enough at the time to merit itself several minutes of laboured film — it is the half-baked stories which make just enough sense to carry the viewer from one scene to the next. 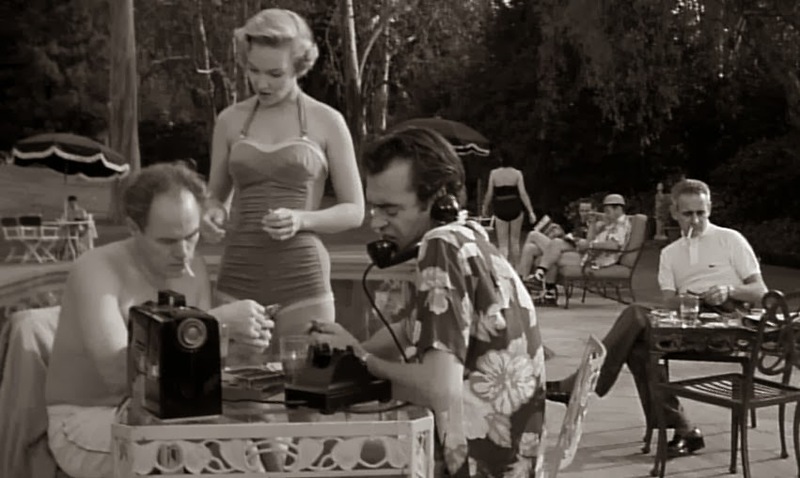 We sound like we don’t rate Kiss Me Deadly, but we do — films don’t need to make sense to work. 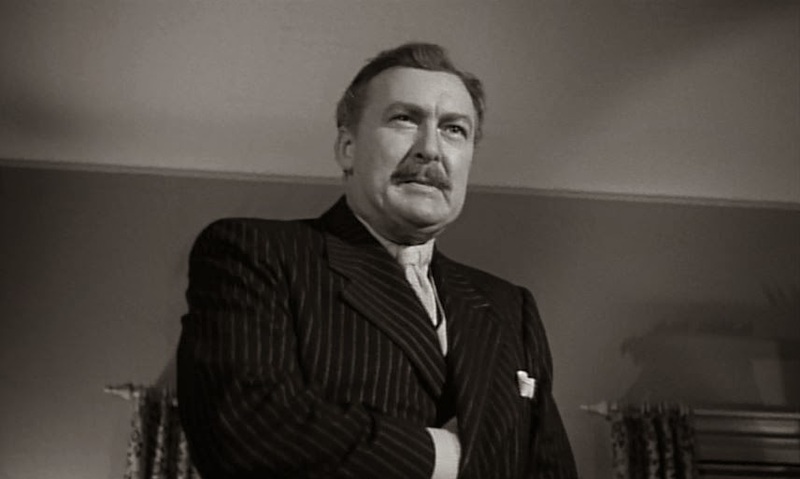 All a film is a story is a set of scenes in a certain order, and they can be linked by the most tenuous of threads. The overall mood is a huge success, as are the locations and the acting. There's another neat performance from Wesley Addy in Kiss Me Deadly, you can see him in among other films, the psychologically scarring John Frankenhiemer sci-fi drama Seconds (1966). 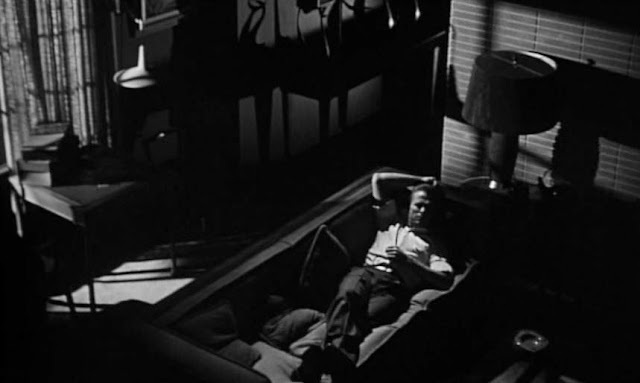 The opening of Kiss Me Deadly is striking, to say the least. It's one of these instances in which you are hooked from the off, as it's just so compelling, bleak and mysterious. 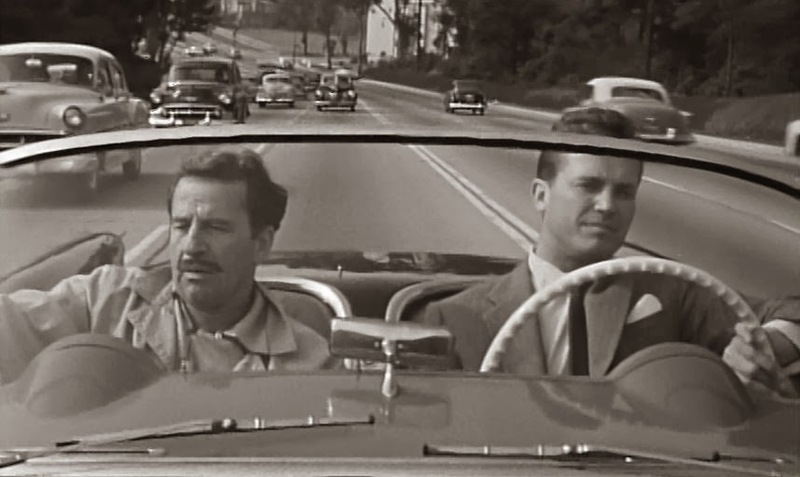 The woman Mike Hammer gives a lift to at the start of the film stops him by blocking the road and forcing him to almost wreck his car. Hammer: No! What's this all about? I'll make a quick guess. You were out with some guy who thought 'no' was a three-letter word. I should have thrown you off that cliff back there. I might still do it. Where are ya headed? Hammer: Do you always go around with no clothes on? 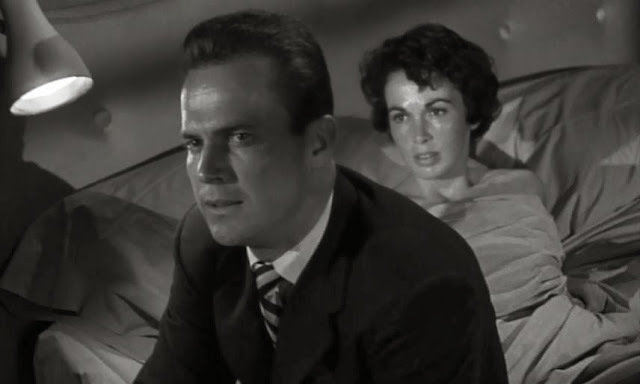 Women are abused in Kiss Me Deadly from the naked trench-coat-wearing Christina who is tortured to death with a pair of pliers, in something that does not appear to belong in the 1950s at all — it is exceptionally uncomfortable seeing her legs dangle there — to the faithful Velda who Hammer abuses every time he sees her. Then there’s Lily, abused by Dr. Soberin, and all, we tell ourselves, in the name of entertainment. 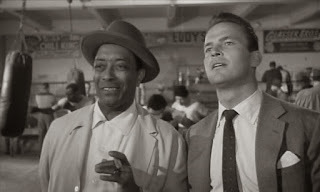 If you want to tell the difference between the film in novel while you are culture coasting this intricate subject, Kiss Me, Deadly the novel (billed with: Mickey Spillane’s Latest H-Bomb!) features a comma, while Kiss Me Deadly the movie does not. Armed with this fact you are ready to become without doubt the most boring person during any discussion of 1950s crime flicks. 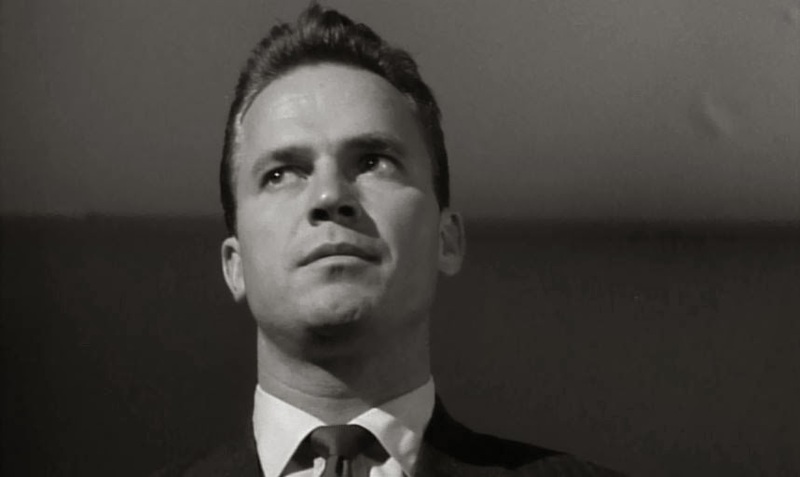 The mention of the H-Bomb is something of a giveaway, although the general mix of film noir, fifties political paranoia and hard-boiled meets sci-fi head on, can be a little surprising at first, if you don’t know what’s coming. 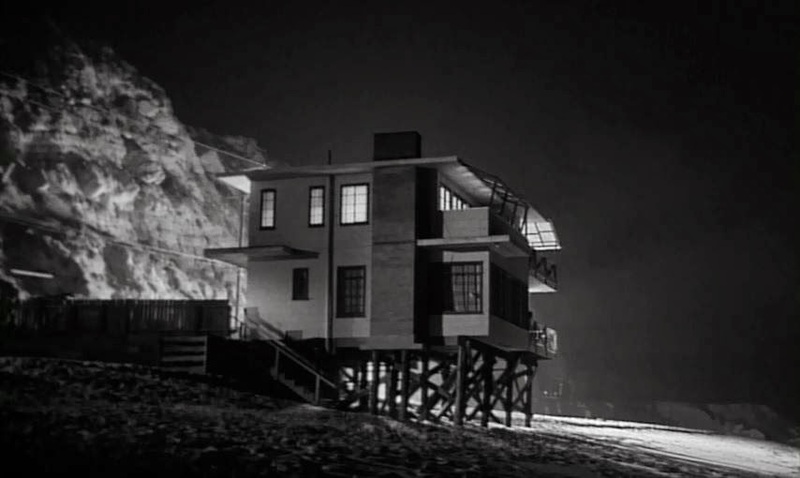 Here in Kiss Me Deadly it was that Robert Aldrich and " Buzz" Bezzerides came up with the original instance of one of Hollywood’s weirdest memes — the glowing suitcase — sometimes called the nuclear suitcase, which obviously doesn’t feature in the novel but was written into the film to ratchet up the already high stakes, shooting the paranoia off the scale and into the industrial strength nerve-twitching fear that only a government-induced world-ending apocalyptic secret could inspire. The suitcase — or the motif of the mysterious box, such as in Repo Man (1984) and Pulp Fiction (1994) — is just one of those things that is testament to the richness of Kiss Me Deadly and the fondness in which its held. As with most other dangerous memes, the nuclear suitcase is not just for the fairy tales, and portable nuclear weapons have been of the greatest interest to science and government since 1950. Why the world persists with these things we will never know, but we do know why science fiction does, and adding the private eye to science fiction, or science fiction to the private eye, was genius. 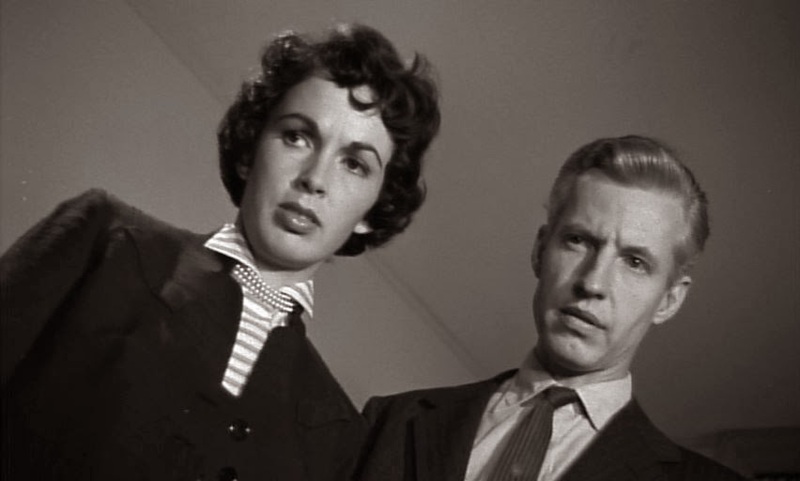 In Kiss Me Deadly the apocalypse signals the end of the film noir cycle. When the suitcase is opened with horrific results, Velda becomes a shrieking human torch, a perverse inferno, and the latest in a line of tortured girls. 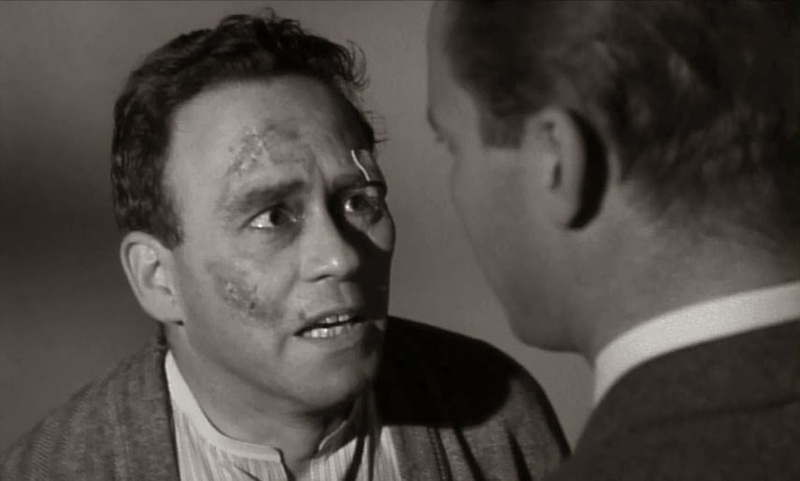 It's not actually an image typical to the noir canon, which always tended to focus on low key cruelty and humiliation, rather than grand destructive gestures and the explosions which have come to be our cinematic staples. But it's an explosive ending and without doubt, a sign of things to come. Crime has gone global, as has the paranoia, as well as a certain silliness that potentially marks this film as comedy, as much as it is crime, or even science fiction. The suitcase - ready for the end! 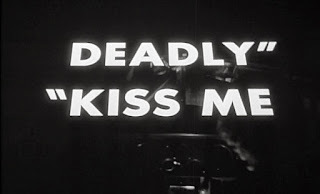 The trailer for Kiss Me Deadly gives away so much of the action, and doesn't truly express the confusion of the finished product. Having said that you can't blame the makers of the trailer for trying to impose some coherence on this classic of all curiosities. 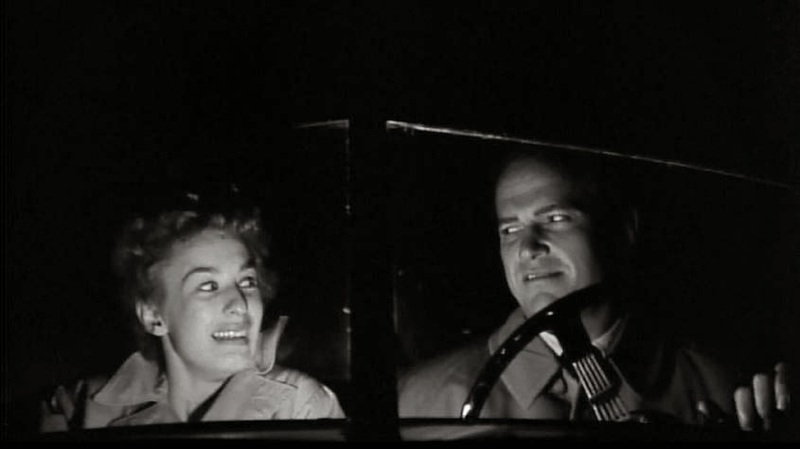 If you've seen Kiss Me Deadly to the end, you may want to see the alternative ending which isn't that different, but you do miss Mike and Zelda up to their knees in the sea. Who dies? This ending says that it's the heroes who peg it, but I was half expecting the screen to go white (it doesn't) to express the idea that the whole world had blown up. 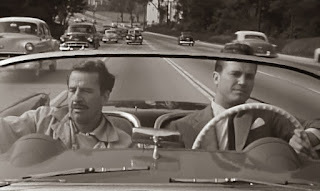 A set of stills from Kiss Me Deadly are included on this page. The unquestionably strange upside down credits, which never caught on, remain unusual and unsettling to this day.